My parents were married in this church in August 1948. It's the Holy Trinity Anglican Church at Woolloongabba, and this picture dates from 1949. I think both my parents must have come to the marriage with issues. My father was 26 and lived at nearby Annerley; he worked up the road from the church at the timber merchants Hancock & Gore. He had returned from serving in New Guinea during WWII, and like many returned servicemen was to deal with PTSD for many years afterwards. My mother was only 19, and she was working at the Metro Cinema in the city. She was still recovering from the shock of losing both parents and a little brother in a train crash just outside Brisbane a couple of years earlier. Despite these travails they raised five happy and healthy children and had a successful marriage right up until my father died from cancer. Mum lives not too far from me and is still independent, although she is just recovering from eye surgery. This church building was the third built on the site - the first one, having been designed by Richard Gailey, was erected as far back as 1870. That building was destroyed in a storm and was replaced by a second timber church in 1875. After WWI the rector of the church became keen on building a more imposing building on the existing site which is perched on a hill not far from the Gabba Fiveways. Parishioners apparently agreed, because a collection was established to accrue funds for the project. 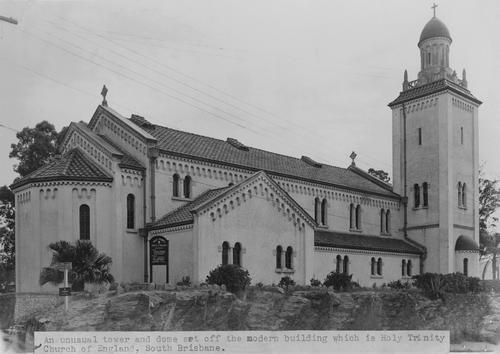 Some commentators have stated that the Anglicans had become jealous of the prominent Catholic churches that were being constructed in prime locations around Brisbane by Archbishop James Duhig, and wanted a showpiece for their own flock to be proud of. Some information on the interior of the church, including technical details of the church organ, can be seen here. I am not surprised the rector of the church wanted a more imposing building, one that competed better with the prominent Catholic churches. And I think the Spanish Mission-type building was indeed impressive. Yes, there are Spanish mission Catholic churches here too - Our Lady of Victories, seen earlier in this blog, is one. Yes yes yes! 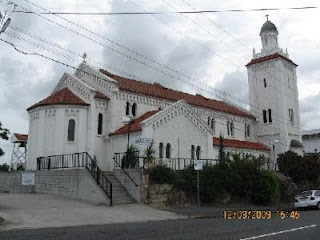 I didn't think we had much Spanish Mission religious architecture in Australia, but Our Lady of Victories Catholic Church is very comparable - both in style and in dates. If anything, Our Lady of Victories is lovelier because the tower is slimmer and more in proportion. Great post. I used to live just down the road from this place, and am glad to know a bit more about its history.